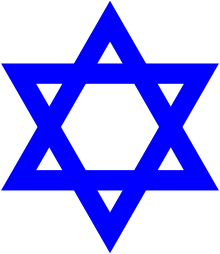 Haketia (Hebrew: חקיטייה‎, Arabic: حاكيتيا‎‎) (also written as Hakitia or Haquitía) is an endangered Jewish Romance language also known as Djudeo Spañol, Ladino Occidental, or Western Judaeo-Spanish. It was historically spoken by the North African Sephardim in the Moroccan cities of Tétouan, Tangier, Asilah, Larache and the Spanish towns of Ceuta and Melilla. Tetuani Ladino was also spoken in Oran, Algeria. An original letter in Haketia from Tangier, written in 1832. The well-known form of Judaeo-Spanish spoken by Jews living in the Balkans, Greece, Turkey and Jerusalem is "Ladino Oriental" (eastern Ladino). Haketia may be described by contrast as "Ladino Occidental". The language is a variety of Spanish that borrows heavily from Judeo-Moroccan Arabic. It evidently also contains a number of words of Hebrew origin and was originally written using Hebrew letters. 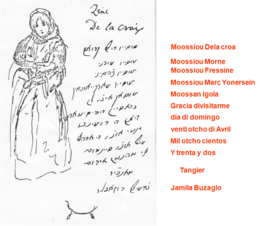 There is some cultural resemblance between the two Judaeo-Spanish dialect communities, including a rich shared stock of Romanzas (ballads) from medieval Spain, though both words and music often differ in detail (as indeed they do between one Oriental-Sephardic community and another). The name "Haketia" derived from the Arabic ḥaká حكى, "tell", and is therefore pronounced with IPA: [ḥ], reflecting the Arabic ḥāʾ ح. In some places it is written "Jaquetía" with the same pronunciation. 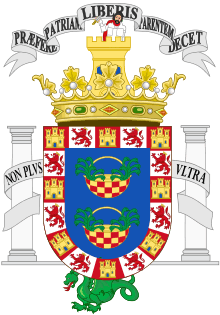 Haketia is considered to have influenced Llanito, the vernacular spoken in the British overseas territory of Gibraltar due to migration of Moroccan Jews. Haketia, unlike other varieties of Judeo-Spanish, did not develop a literary tradition, so the language remained as a colloquial form of communication and was not used as a vehicle for formal education since in Spanish Morocco, Spanish was used along with French at the Alliance Israélite Universelle schools. Many Jews from North Morocco emigrated to Venezuela, and the language was leveled with modern Spanish, which has contributed greatly to its extinction. Still, there has been a slow renaissance of the language, helped by musicians such as Doris Benmaman, Mor Karbasi and Kol Oud Tof Trio, among others. Jose Benoliel and Alegría Bendayan de Bendelac have both compiled Spanish-Haketía dictionaries, published in 1977 and 1995, respectively. The Caracas Center of Sephardic Studies publishes regularly articles in Haketia in its magazine Magen-Escudo. ↑ Benoliel, José (1977). Dialecto Judeo-hispano-marroquí o Hakitía. Madrid. OCLC 5982985.